Pearls are spherical to subspherical to irregularly-shaped, biogenic concretions of slightly iridescent, nacreous aragonite (CaCO3 - calcium carbonate). Pearls are principally made by pearl oysters (Animalia, Mollusca, Bivalvia). Natural pearls are scarce. Well-formed, spherical natural pearls are rare. Fossil pearls are known, but are also scarce. "Mother of pearl" is relatively common - the same material in pearls occurs in the actual shells of some bivalves. Well-known pearl oysters include Pinctada margaritifera (the black-lipped pearl oyster), Pinctada fucata (the Japanese pearl oyster), and Pinctada maxima (the gold-lipped pearl oyster). Mother-of-pearl is well developed in shells of other species such as Pinctada imbricata (Atlantic pearl oyster), Pteria colymbus, Pteria penguin (both are winged pearl oysters), Haliotis spp. (abalones), and Atrina spp. (pen shells). Natural pearls form when foreign objects, such as sediment grains or other debris, enter a pearl oyster and get embedded in its mantle tissue. The particle is slowly coated with nacreous aragonite, which prevents the particle from causing disease or injury. The end result is a biogenic concretion called a pearl. Natural pearls show a concentric structure through the entire cross-section. Almost all commercially available pearls are semi-natural - they have been cultured. Cultured pearls have been available for many decades. A spherical bead is placed inside a pearl oyster, under its mantle tissue. The bead is slowly coated with nacreous aragonite to produce a cultured pearl, which shows concentric structure only in the outer portions of its cross-section. 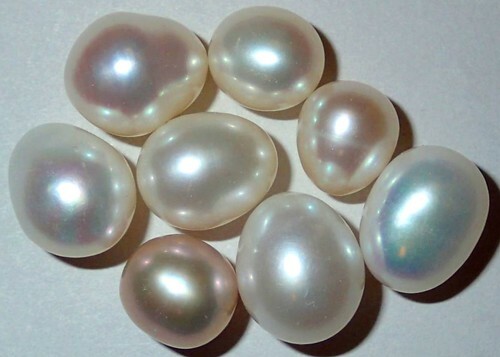 Marine pearls can be whitish, pinkish, yellowish, or blackish. Freshwater pearls are also known - natural examples vary from ~spherical to highly irregularly-shaped. Blister pearls are attached to the host mollusc's shell.